Are You a Habitual Complainer? Society is full of whiners and complainers. Sure, there are times when there is a legitimate reason to complain. However, more often than not the complaining requires more time and more thought energy than would have been required to seek a solution or correct the issue at hand. If I were to ask you who the complainers are in your life would people instantly come to mind? I’m willing to bet not only does someone, but I bet you thought of more than one person. There are simply some people in life who aren’t happy and it seems the only thing that brings them any degree of satisfaction is to share their unhappiness with everyone around them and anyone who will listen. All the while never taking responsibility for their own actions, which may be contributing to why they are unhappy in the first place. If you looked at the title of the blog and then compared it to the picture of tulips you might be asking yourself, “why did he choose that picture?” Well, here’s the answer. I often use the following story when I’m training an organization or speaking in front of an audience at a conference. I’ll ask, “have any of you ever been to Holland in the spring?” It’s a beautiful country, year round, but especially in the spring. I’ve been to Holland and on one such trip, I can remember seeing pasture after pasture filled with the most vibrant colors of tulips for almost as far as the eye could see. It was truly breath-taking. So what does that have to do with complainers? Because I know people who are professional complainers and if you were to put them right smack dab in the middle of one of those amazing tulip fields they would still point to the lone bee buzzing about and complain. Sometimes people even complain about a gift they’ve received. Let’s say you purchase a program license that permits you to market and sell tickets to a once a year broadcast. Out of gratitude and loyalty for having purchased the license, the licensing company decides to extend to you the right to do unlimited rebroadcast of the program at no additional cost, but only for four additional months. Sounds good, right? Well, let’s say the previous year they authorized you unlimited rebroadcast for five months. Would you choose to call them out in a public forum and decry why they are taking 30 days away from you? Sounds crazy, doesn’t it? Yet I recently saw this happen. I mean, seriously, are people not able to recognize a gift when they receive one? The company doesn’t have to extend any additional replays or time to the purchasers. It’s a gift and should be recognized and accepted as such. I’m curious, do any of you reading this enjoy working for or spending time with someone who complains a lot? Anyone? anyone? [channel Ferris Bueller’s Day Off]. Let me help…the answer is no. No one likes working for or hanging around people who nitpick and complain a lot. I love what John Knox said, “you cannot antagonize and influence at the same time.” When you influence you draw people to you and when you complain you repel them away. You may not see this occur right away, but repeated over time it’s exactly what happens. Now, can I tell you I never complain? Absolutely not, to say so would be untrue. However, I do my best to not make a habit of it and I also remain hyper-aware of when and whom I complain to. As a retired military member who spent 10-plus years enlisted and another 11 as an officer, I adhered then, as I do now, to a very simple rule. You complain up the chain and not down. It’s not always easy advice, but I find it essential to maintaining order and trust. I can’t tell you how many times I’ve had someone point out a problem or express their unhappiness over the way something is or isn’t being done. Please hear my heart when I tell you I don’t want to ever be surrounded by “yes” men. You know, the kind who tell you every thought and action is the best. I want people around me who are willing to call attention to something that’s not working optimally. However, I’d prefer they be the kind of people who are also willing to help me and others generate solutions. One of my favorite presidents from the past was Teddy Roosevelt. President Roosevelt said, “complaining about a problem without posing a solution is whining.” When we complain we assign blame to others. When we identify opportunities to improve something and present solutions we take ownership. Explore options. When something doesn’t work out or work like you had hoped, step back, take a deep breath, and ask yourself, “what am I missing or what can I do to change the outcome. Seek the good. Instead of focusing on what isn’t going well take a moment and acknowledge what is right. Get an accountability partner. I have people in my life who I love, who love me, and who I know have my best interest at heart. If I fall into a rut of complaining they have my permission to call it so I can get refocused. Avoid absolutes like never and always. It’s not uncommon to hear people complain and say things like, “it never works or it’s always broken” or “why does this always happen to me.” Rarely, if ever, does something “always” happen or “never” work. Declare noble intent. Complaints often involve other people and boil down to miscommunication. Instead of complaining about another person or portraying them as a demon, ask yourself, “did they really mean to do that to me?” I believe that in most cases people are so focused on themselves that they are simply unaware of how their action or inaction is affecting others. I hope you found value in this article. I would love to hear from you. 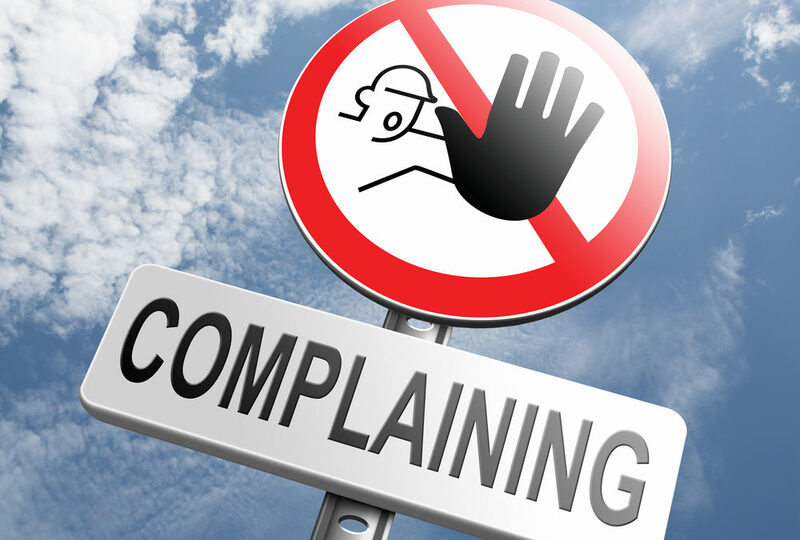 What suggestions do you have to curtail complaining? Until next time, go forth, do great things, and always Be Exceptional! Jay Johnson is Founder and CEO of J2 Servant Leadership, LLC. He is a Motivational Speaker, International Trainer, Coach and Consultant. Jay is also an Executive Director with The John Maxwell Team and member of Forbes Coaches Council.